Mobile devices are a central part of our personal lives, and many educators and institutions around the world have adopted them as tools for engaging 21st-century learners. Mobile learning can enhance language learning by enabling instant access to updated information; communication with peers and experts through social networks; collaborative work; and the creation of digital artifacts that combine images, video, and sound. As Hockly (2013) states, it is not the technology itself that enhances learning, but rather the use to which it is put. 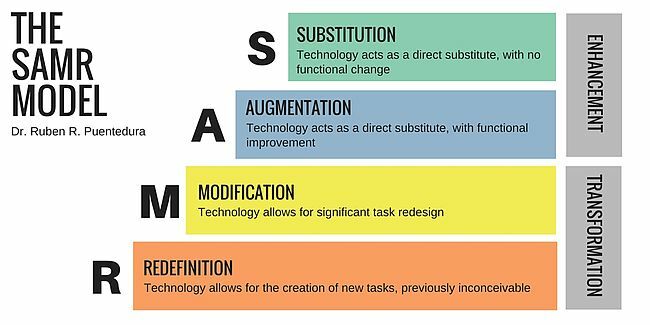 The substitution augmentation modification redefinition (SAMR) model (Puentedura, 2010) provides teachers with a useful framework for successful technology integration while it helps them design and evaluate mobile learning activities. Substitution: Technology is just a tool substitute, with no functional change. Augmentation: Technology still acts as a direct tool substitute, but with functional improvement. Redefinition: Technology allows for the creation of new tasks previously inconceivable. According to Romrell, Kidder, and Wood (2014), learning activities that fall within the substitution and augmentation stages are said to enhance learning, while learning activities that fall within the modification and redefinition classifications are said to transform learning (see Figure 1). The ratio of activities you use within each classification depends on the level of technology integration you are seeking. If your objective is to embed technology fully into your curriculum, you should aim for all of your activities to fall within the modification and redefinition classifications (so that all activities involving technology transform your students’ learning). In this article, I describe some task examples for each level of the SAMR model that can be adapted for different levels and ages. An important point to consider before designing mobile learning activities is the physical limitations of mobile devices: small screens, no physical keyboards, inadequate memory, and short battery life. Therefore, tasks should be kept as brief and simple as possible. Substitution level: Share the PDF text via email or instant message, which students read on their mobile devices. Alternatively, they read an online version of the text. At this level, the students are substituting a text or book in paper format for a digital format such as PDF. There is no functional change because this activity can be done without a mobile device. Augmentation level: Students use online dictionaries and web resources to supplement the reading activity. If the book is delivered in e-book format, students can bookmark pages, make notes, and highlight and save passages. Some e-book readers also include built-in dictionaries and alterable font sizes and styles. Some recommended e-book reader apps: Kindle (iOS and Android) and Google Play Books for Android and iOS. Students can use Diigo to collaboratively take personal notes and highlight text information on web pages and PDF documents. Modification level: Students use multimedia resources such as text, visuals, audio, and videos to support the reading activity and expand concepts. They do self-graded quizzes to test comprehension. Here is a list of tools to create quizzes easily: 10 Great Web Tools for Creating Digital Quizzes. Using graphic organizers to visualize how ideas fit together and construct meaning. Some useful resources: Holt, Kidspiration, and Tools 4 Students. Creating collaborative mind maps to demonstrate understanding of the story and its key elements. Check this list of recommended mind mapping apps and tools. Students can also create a digital presentation or slide show, either individually or collaboratively, to summarize the text or focus on certain aspects. Google Slides is a popular tool for easy presentation creation. Check this list for alternatives: Best Classroom Tools for Presentations and Slide Shows. Substitution level: Instead of handwriting the short story on paper, students type it on their mobile device using a note-taking app or a digital tool such as Google Drive, Microsoft Office Online, Evernote, or Etherpad. Augmentation level: As they write the texts on their mobile devices, students can highlight words, check spelling, and customize and format fonts and styles. They can also use voice-to-text tools to convert spoken language to written language. Modification level: Students can enrich the text by adding images, sounds, animations, and videos. They can also write the text collaboratively using some of the online tools mentioned in the previous levels, and receive teacher feedback through comments and annotations on the document. See The Best Online Writing Apps for Collaboration for a list of tools for collaborative writing. Redefinition level: Students post their written productions to their class blog and share it on social networks such as Twitter or Facebook. Hashtags on Twitter make it easier for teachers and students to search for tweets about a specific topic. An interesting way of distributing and sharing written work is by means of QR codes. A QR code can be read using smartphones and tablets, and they link directly to articles, websites, videos, and more in a matter of seconds. Substitution level: Students use their mobile devices to take photographs of specific vocabulary items (objects, food, actions, emotions). Augmentation level: Learners annotate and label the images using apps such as Thinglink, Pic Collage, or PicsArt. Annotation is a good way for students to illustrate their understanding of the word meanings. They can also share their images on Padlet, an online digital wall, and comment on their partners’ photos. Modification level: Students create a multimedia presentation or slideshow on which they include the assigned vocabulary. Alternatively, instead of using photos, they can record videos showing the target vocabulary items. Redefinition level: Students write a story or a short text with multimedia content to integrate the new vocabulary, either individually or collaboratively. Using apps such as Book Writer or StoryKit, they can turn their texts into e-books, which can be shared on the class blogs and social networks. To conclude, mobile devices can transform traditional classroom tasks and become powerful tools to engage today’s learners—as long as pedagogy is prioritized over technology. Teachers should be aware of how any task—even those outside of mobile learning activities—is affecting their pedagogy, and they should consider how to address the technical, pedagogical, and management issues that will arise during the implementation of the mobile learning activity (Romrell et al., 2014). María Mercedes Kamijo is an EFL teacher specialized in mobile learning and e-learning. She is a member of TESOL Argentina and currently teaches online courses in educational technology. She is coauthor of the e-book Mobile Learning: Nuevas realidades en el aula. Free TJ Article: "Vocabulary Knowledge and Vocabulary Use in Second Language Writing"
Registration for the TESOL 2018 International Convention & English Language Expo , 27–30 March 2018 in Chicago, Illinois, USA, is now open.